The Flak 30 (Flugabwehrkanone 30) and improved Flak 38 were 20 mm anti-aircraft guns used by various German forces throughout the Second World War. It was not only the primary German light anti-aircraft gun, but by far the most numerously produced German artillery piece throughout the war. It was produced in a variety of models, notably the Flakvierling 38 which combined four Flaks 38 onto a single carriage. The Germans fielded the unrelated early 2 cm Flak 28 just after World War I, but theTreaty of Versailles outlawed these weapons and they were sold toSwitzerland. 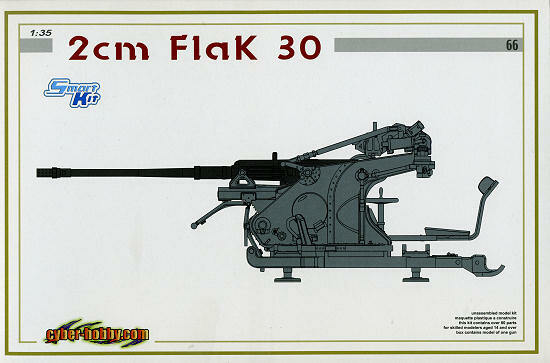 The original Flak 30 design was developed from theSolothurn ST-5 as a project for theKriegsmarine, which produced the 20 mm C/30. The gun fired the "Long Solothurn", a 20 × 138 mm belted cartridge that had been developed for the ST-5 and was one of the most powerful 20 mm rounds in existence. The C/30 featured a barrel of 65 calibers, firing at a rate of about 120 rounds per minute. The C/30 also proved to have feeding problems and would often jam. This was offset to some degree by its undersizedmagazine, which held only 20 rounds, which tended to make reloading a common requirement anyway. Nevertheless the C/30 became the primary shipborne light AA weapon, and equipped a large variety of German ships. The C/30 was also used experimentally as an aircraft weapon, notably on theHeinkel He 112, where its high power allowed it to penetratearmored cars and the light tanks of the era during theSpanish Civil War. Rheinmetall then started an adaptation of the C/30 for Army use, producing the 2 cm Flak 30. Generally similar to the C/30, the main areas of development were the mount, which was fairly compact. Set-up could be accomplished by dropping the gun to the ground off its two-wheeled carriage and leveling with hand cranks. The result was a triangular base that allowed fire in all directions. CyberHobby has provided us with a FlaK gun that they have not previously offered. The new tool kit does not have a wheeled carriage, so I suspect that will be another boxing. 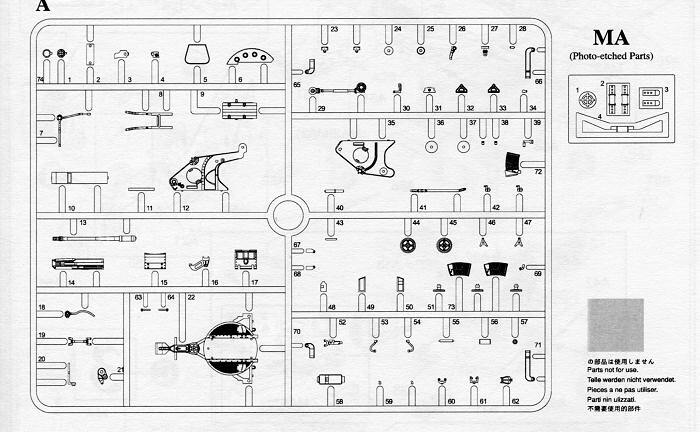 It does have all of the detail that you and I have come to expect from CyberHobby. Despite being just one sprue with a small photo etch fret, there are 80 pieces to this particular kit. . The gun can be optionally elevated and comes with the triangular base mentioned in the historical section. The gun can be assembled for either transport or combat and I suspect that since there is no carriage, most will choose the latter (unless you want to mount it on the back of a truck, for instance). Typical of modern slide-molding, the end of the gun barrel is hollow. One can also choose not to install the ammunition pack if one wishes. The photo etch is minimal and some of it, such as the gun sight parts, are optional. Instructions are well done with the usual Model Master references. However, since this is an early war gun, your only color option is Panzer Grey with a Steel or Gunmetal cannon. Many modelers enjoy building just the guns and this one will fall right into that area. It is also nice to have a superbly detailed kit that does not have 500 pieces! Thanks to www.dragonmodelsusa.com for the preview kit. Get yours today at your favorite store.